The Ian Dickie range of Mid Block Jets are highly effective for clearing pipes from 75mm - 400 mm and offer a choice of electric start, diesel or petrol engines. 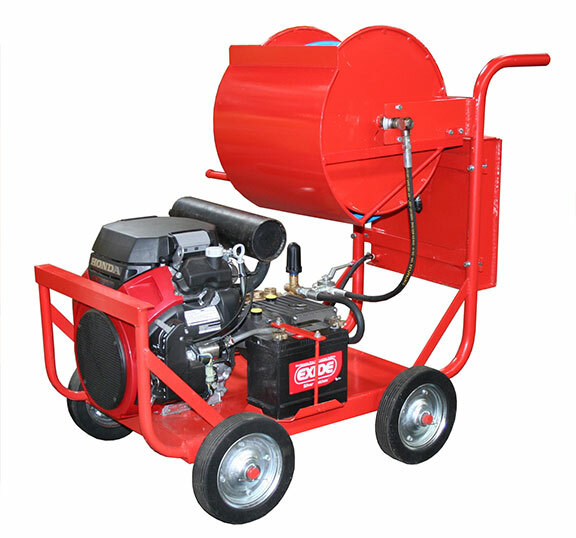 The Maxi Jet is a robust and highly maneuverable machine that effectively clears lines from 75mm-160mm and is able to operate from a standard house-hold water supply. Features include: 80m lightweight sewer hose, high quality triplex plunger pump with reduction gearbox, fully adjustable pressure unloader valve, in-line filtration, hour meter and much more. When used in combination with our wide range of rotating nozzles, the Maxi Jet easily resolves mid blocks in sewage lines or clears pipes of grease, fat, sand and calcium build up. *Clearing of 40mm and 50mm lines is achievable with our optional Drain Accessory Kit.